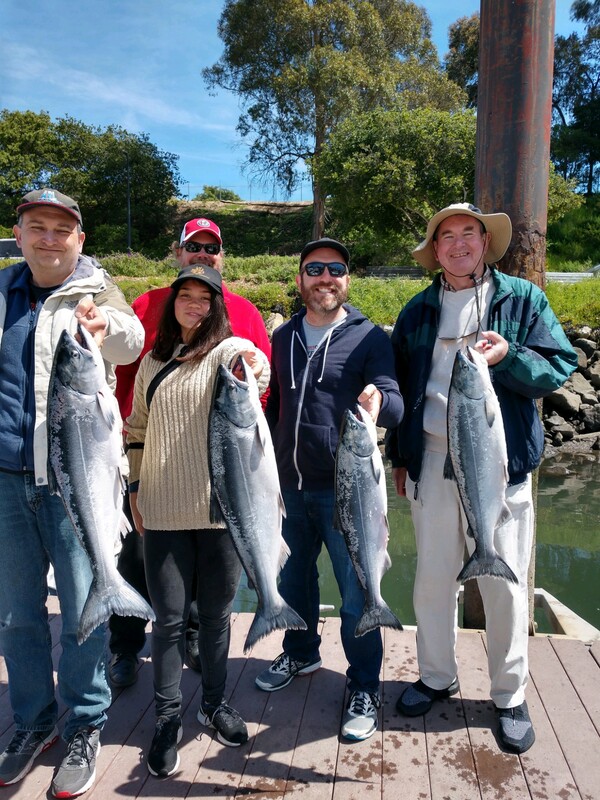 The charter today fished south of Santa Cruz and caught limits of salmon short by one. 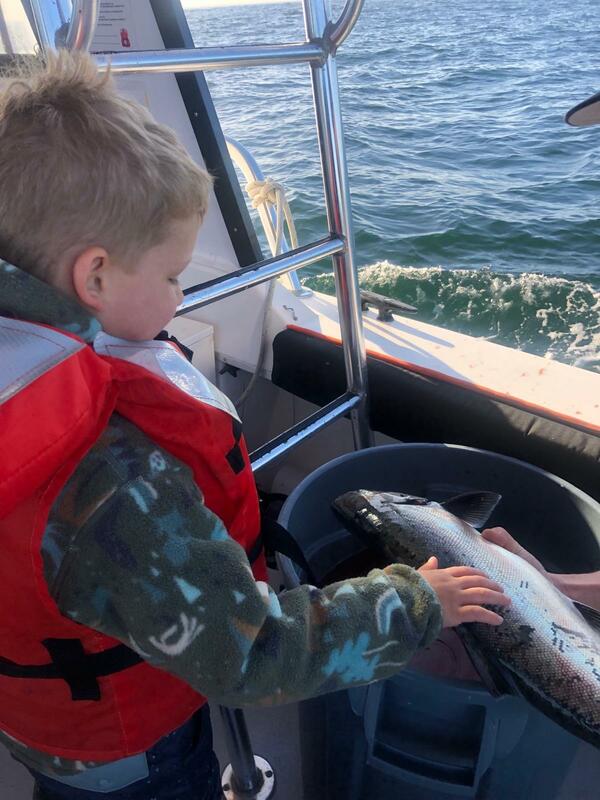 Captain JT’s 4 year old cousin Mason was on board with his Dad Patrick and other friends. 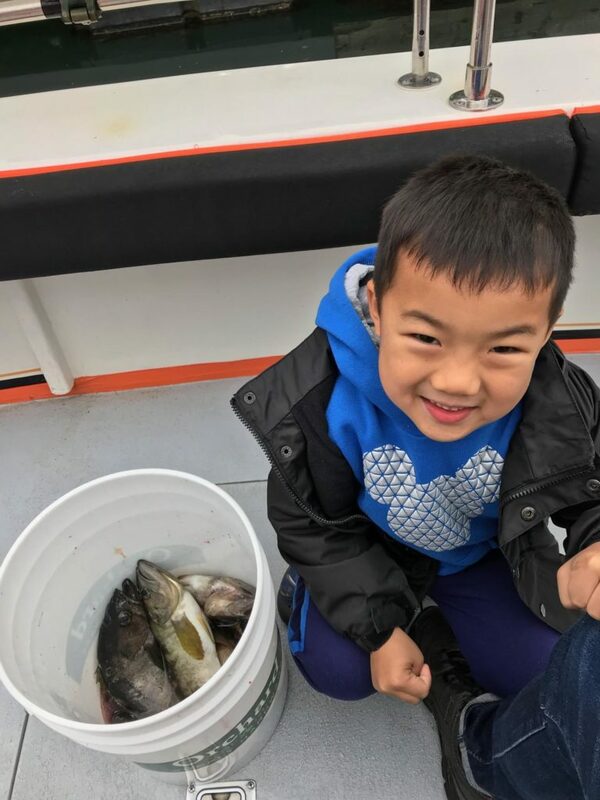 He was a little timid with the fish but rightfully so – they were as big as him. Everyone had fun. 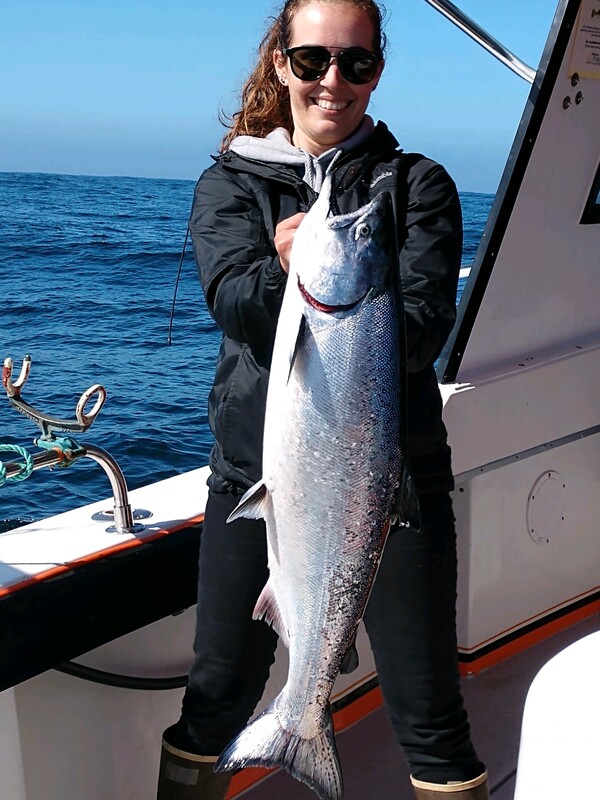 Call to book your charter while the salmon bite is hot. 831.234.6155. Here we go again. 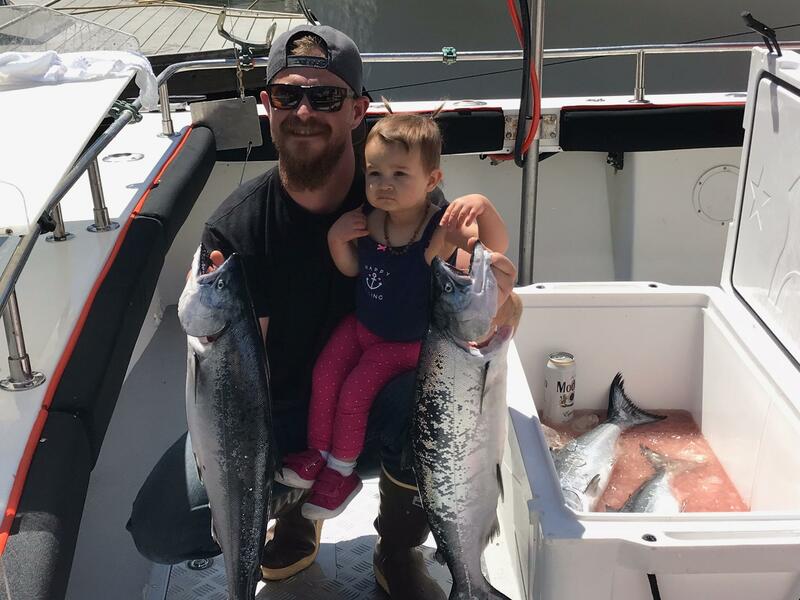 Another great day of fishing for salmon. The clients today had crew limits by 11am today. The weather was nice as was the water. 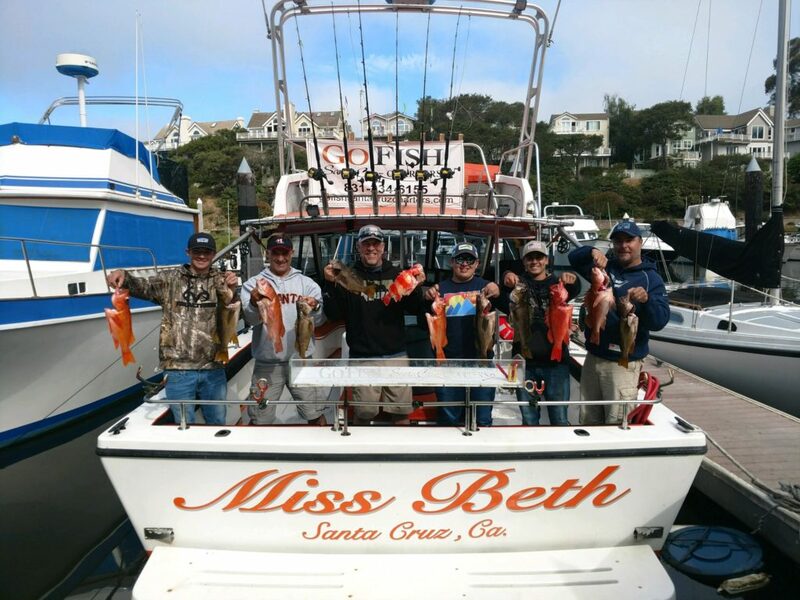 Call to book your charter with Go Fish Santa Cruz Charters. 831.234.6155. Another great day of catching. 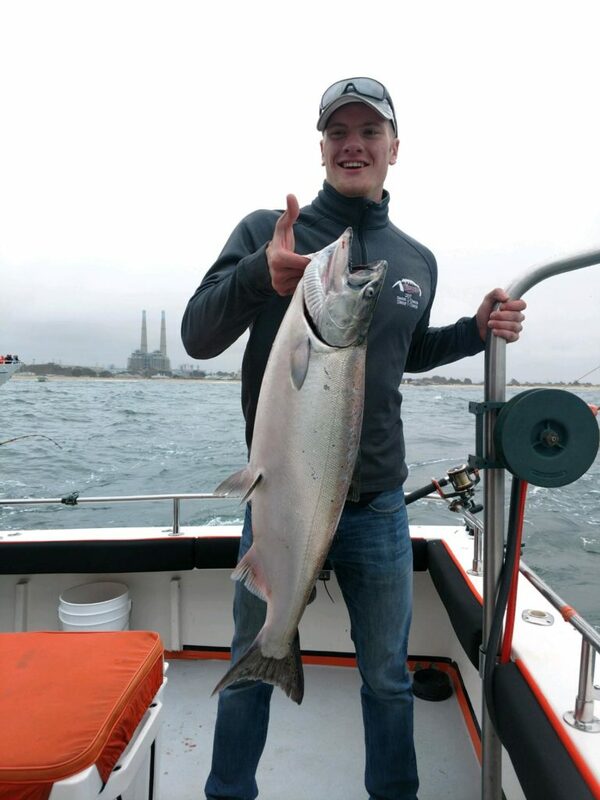 Limits of salmon by 9:30 this morning. It was a trip with KG and friends including his beautiful fiancée Kirsten. The salmon bite continues to be hot. Call to book your charter. 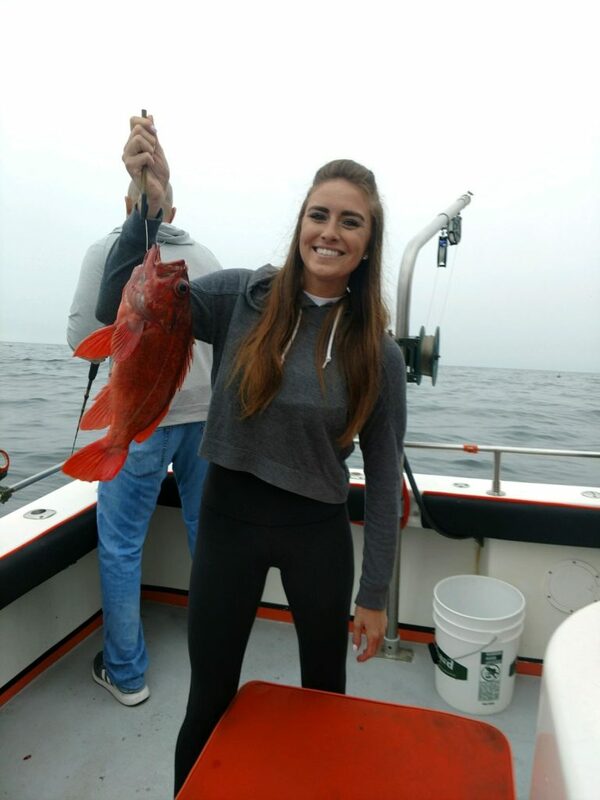 Check out one of Kirsten’s catch not including future husband KG. 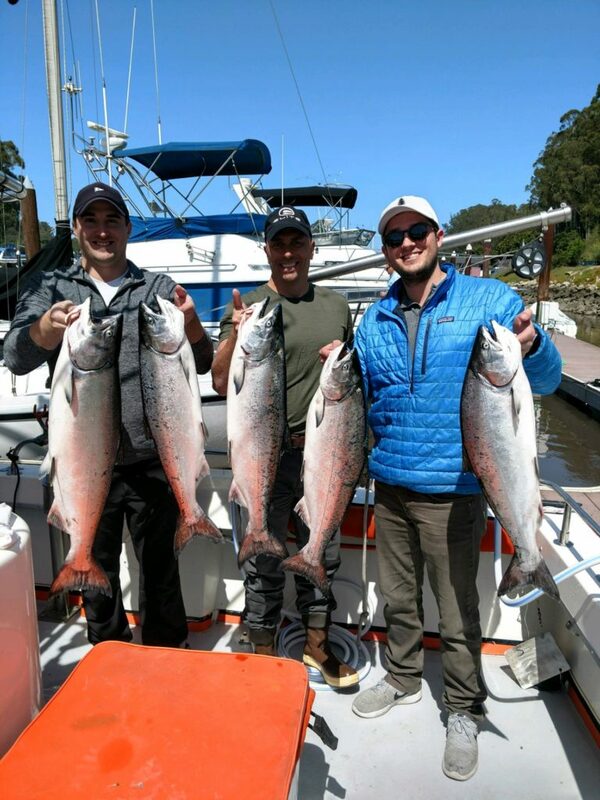 Another great day of fishing for salmon. 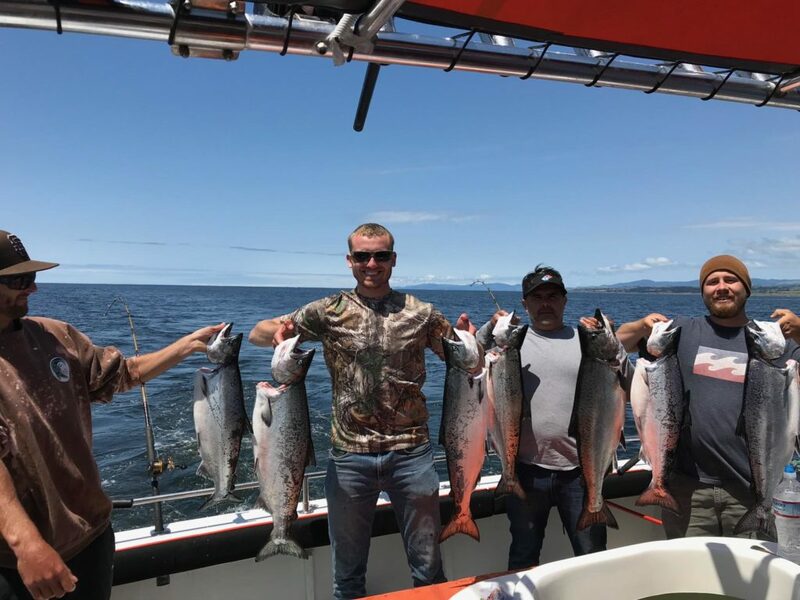 Almost limits of some nice kings. Call to book your charter. 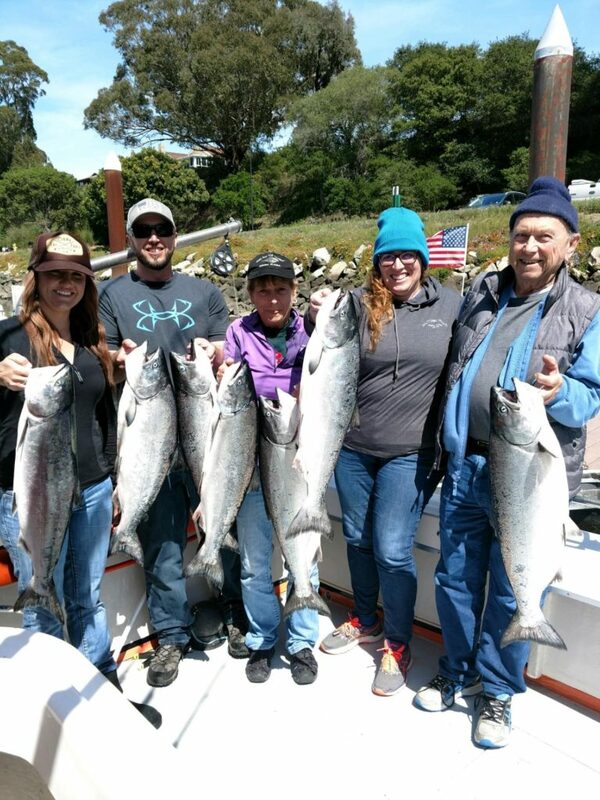 Today’s charter fished near the Soquel Hole. They landed four, lost five and a shaker. The water was great until about 10:30am and the wind started to come up and we worked out way back. 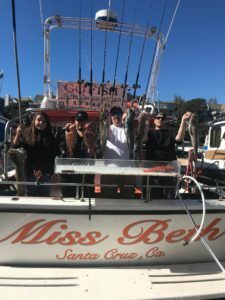 Call Go Fish Santa Cruz Charters. 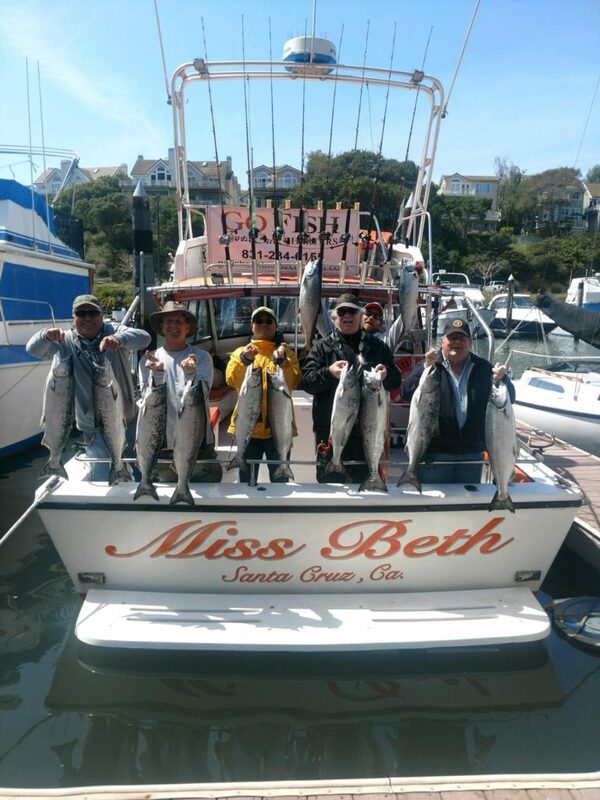 Go Fish Santa Cuz Charters fished the Mulligan’s area. 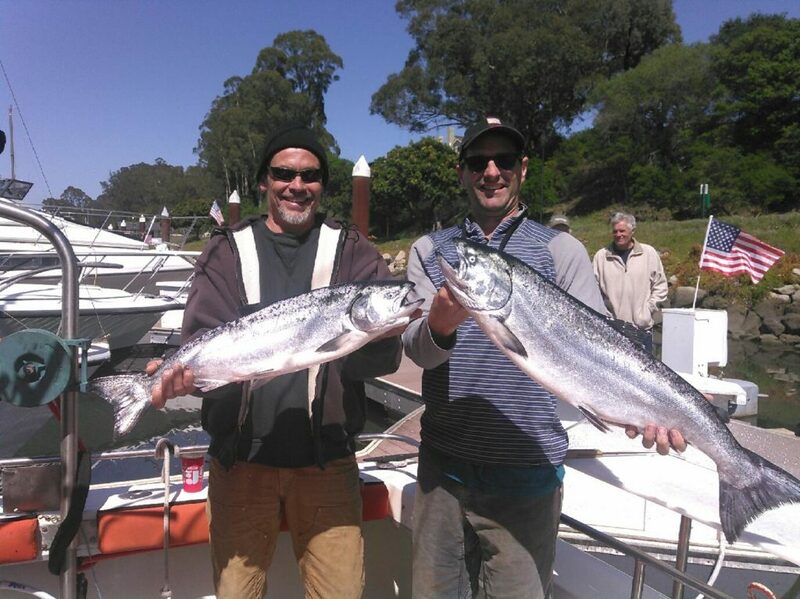 The clients caught some nice King Salmon. The bite continues to be good. 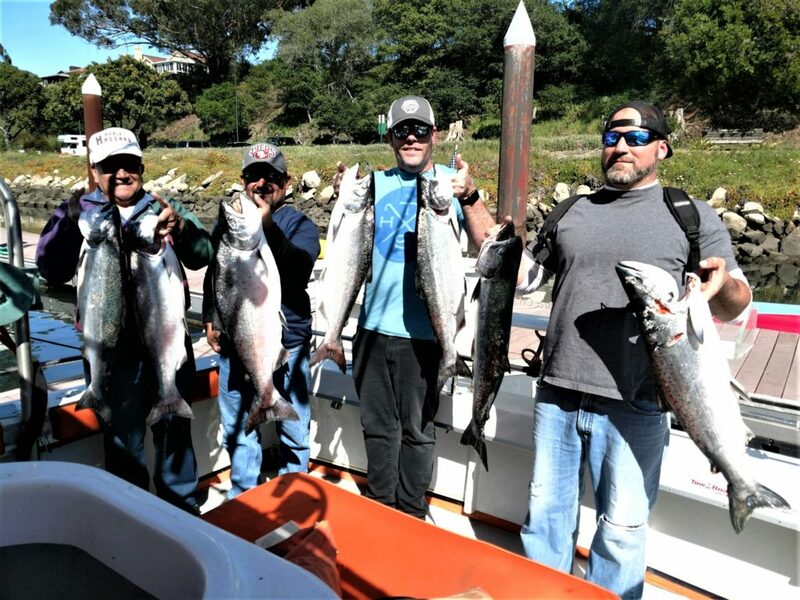 Call 831.234.6155 to book your charter. The charter today was cancelled due to wind. The Salmon bite is hot. 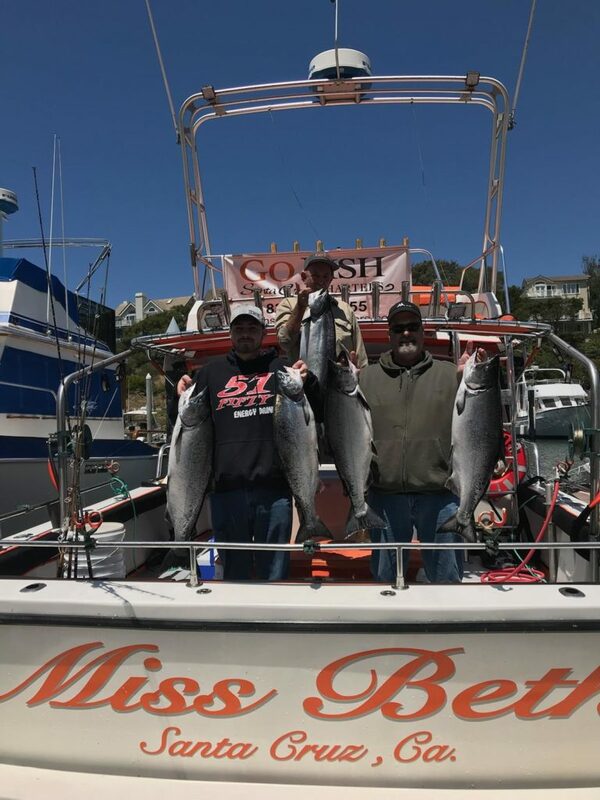 Limits of salmon today!!!! 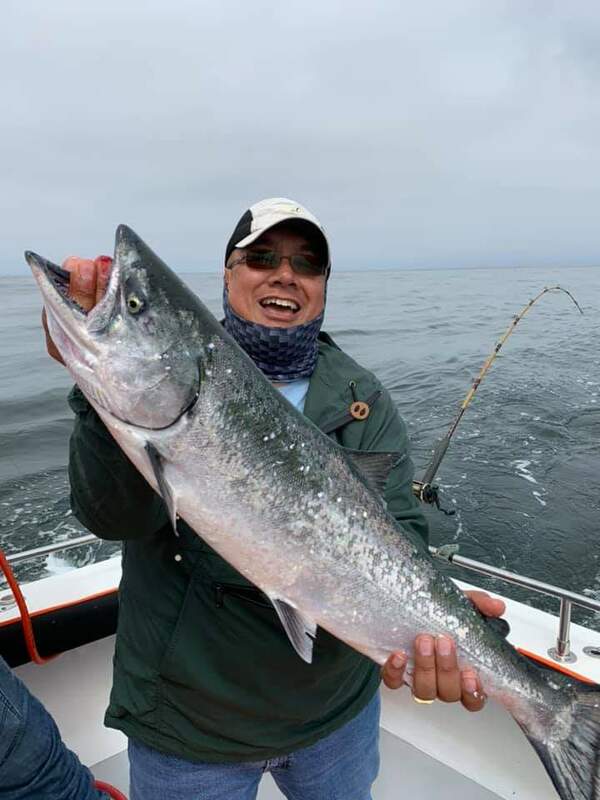 We fished again the Mulligan’s area catching 10 beautiful King Salmon. They lost 5 to sea lions. 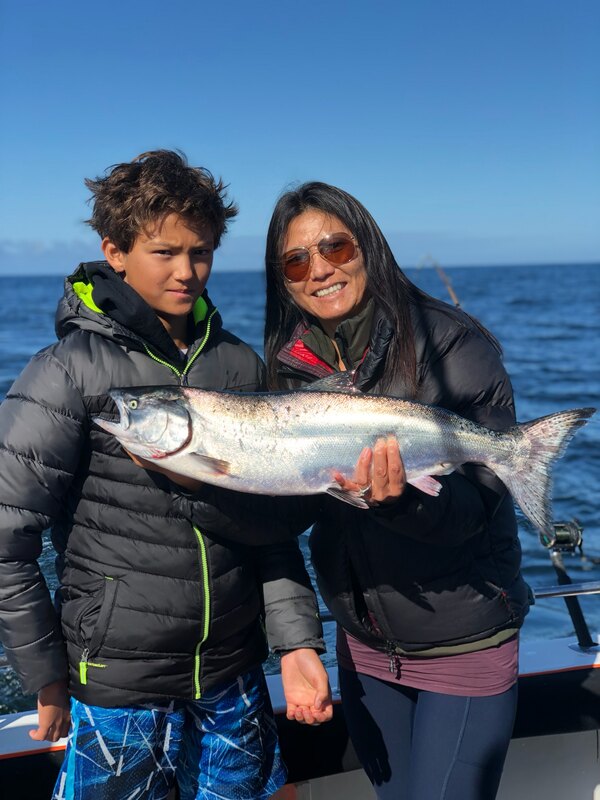 Still, it proves the salmon are here and on the bite. According to the clients the weather and water was as nice as it can get. Thanks Harry and friends. 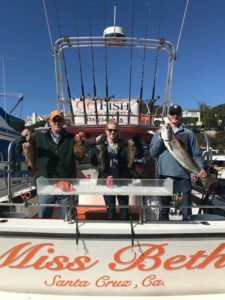 Call to book your charter. 831.234.6155. 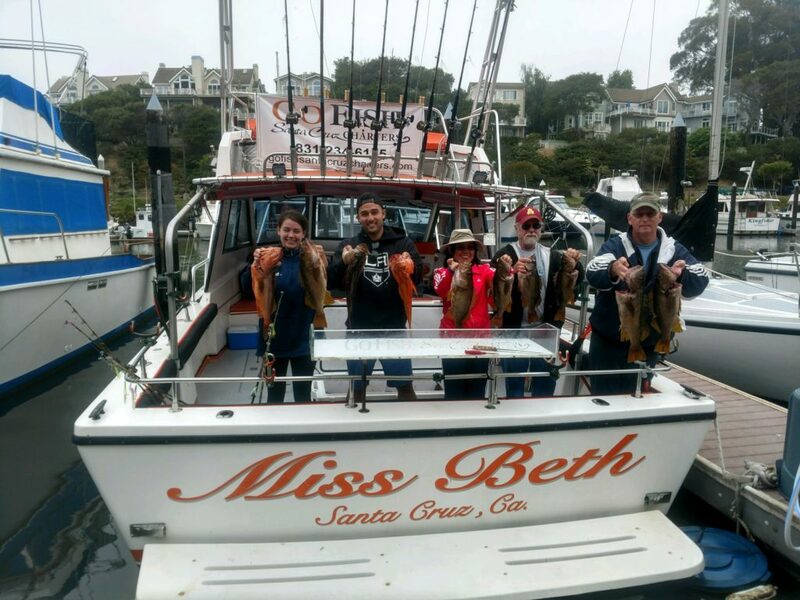 Go Fish Santa Cruz Charters. 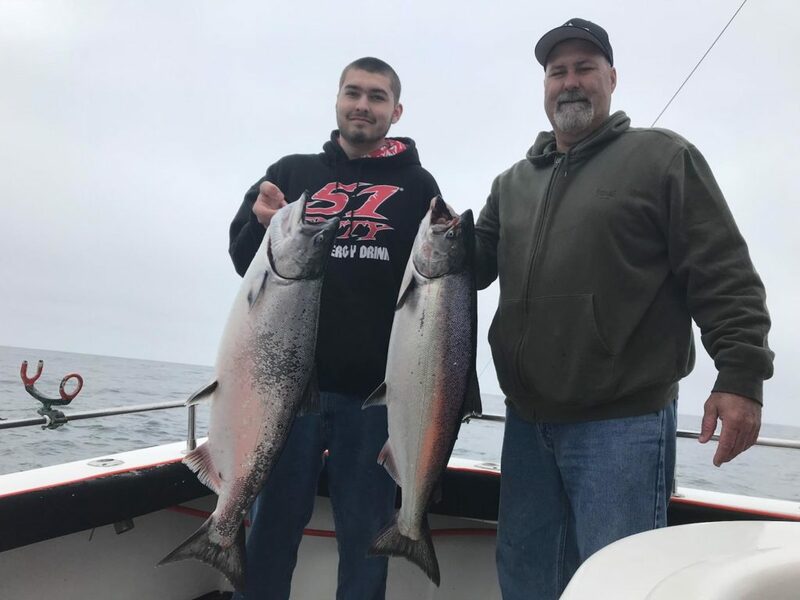 Today was opener for 2019 Salmon Season and it looks like it is going to be a good season. Today they fished the Mulligans area and caught six beauties. Sadly, they lost that many at the boat. Still, everyone had a blast and you will too. We have seats available. Call to book your charter. 831.234.6155. 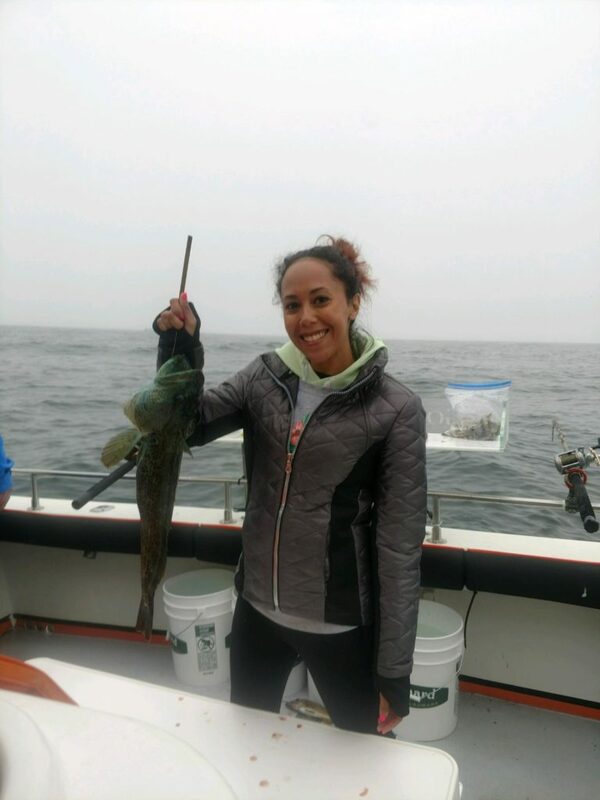 Today’s charter went catching. 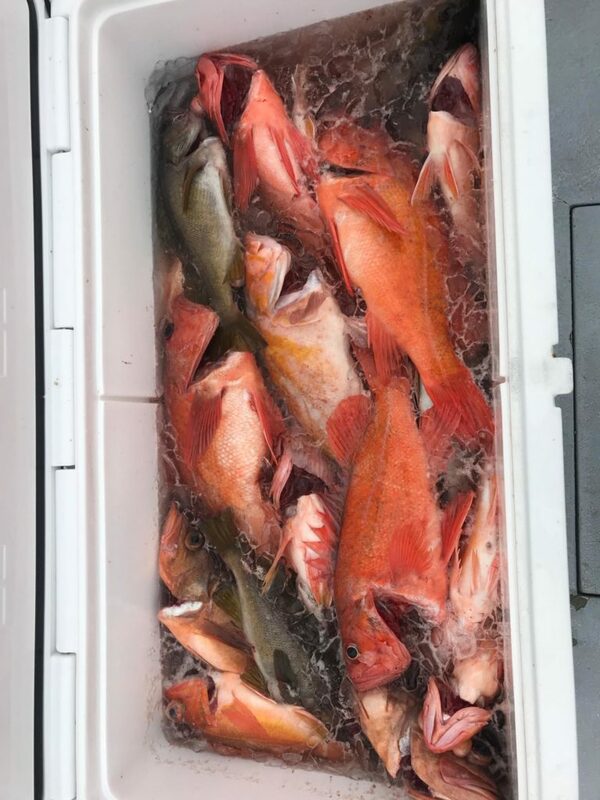 They caught limits of a variety of BIG rock fish including vermillion, coppers, yellow tail, green spot and a flag fish. They landed some petrole sole and some nice ling cod. 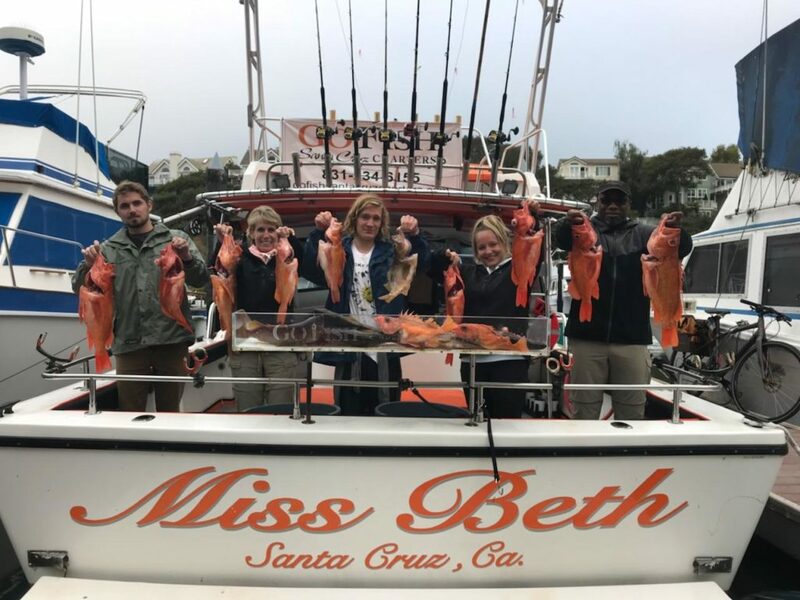 We have charters available. Call to book your charter. 831.234.6155. 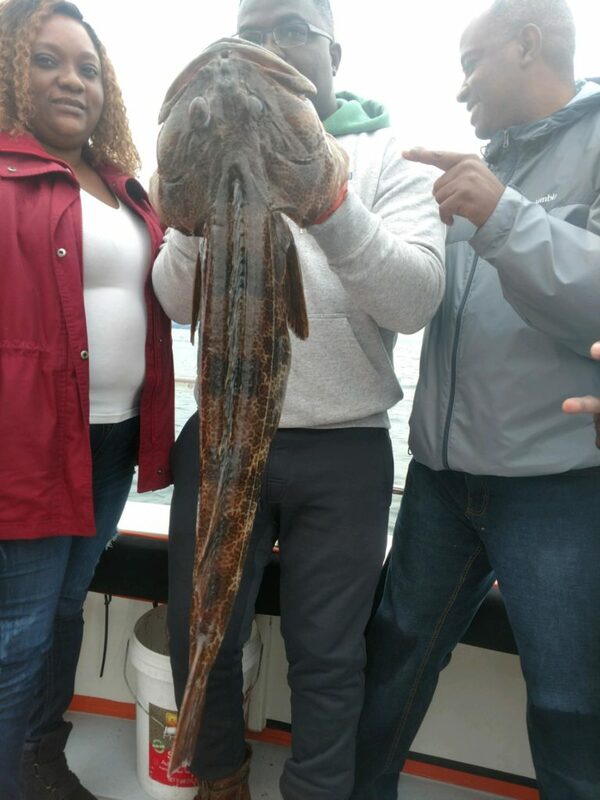 Todays charter was more of the same. 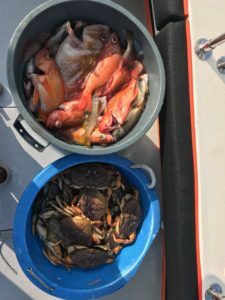 Crab pots yielded limits of 10 per person by 9sm. 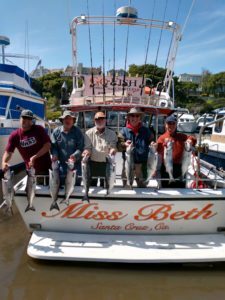 Then off to Davenport for limits off to Davenport area for limits of rock fish. 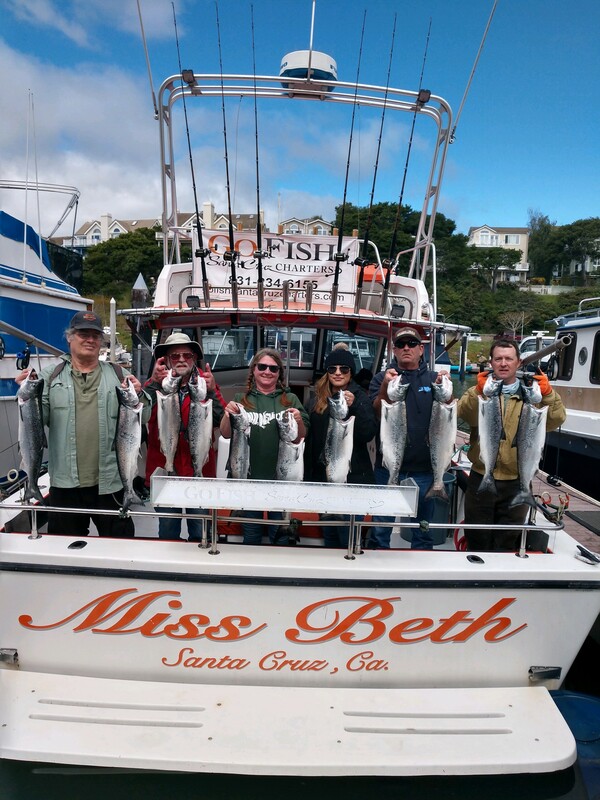 We have charters available. Call to book yours. 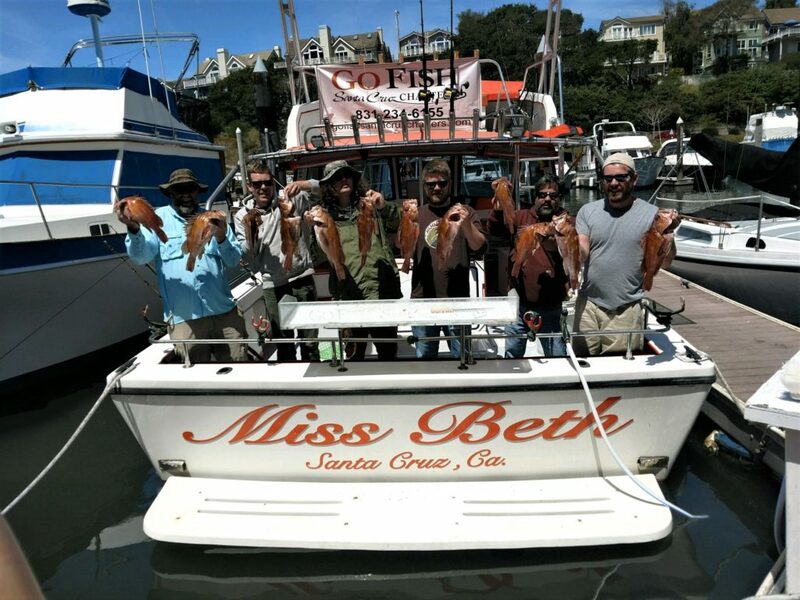 We pulled 6 of the 30 pots which yielded 48 crab. One port had 19 beauties. We were done crabbing by 9AM. 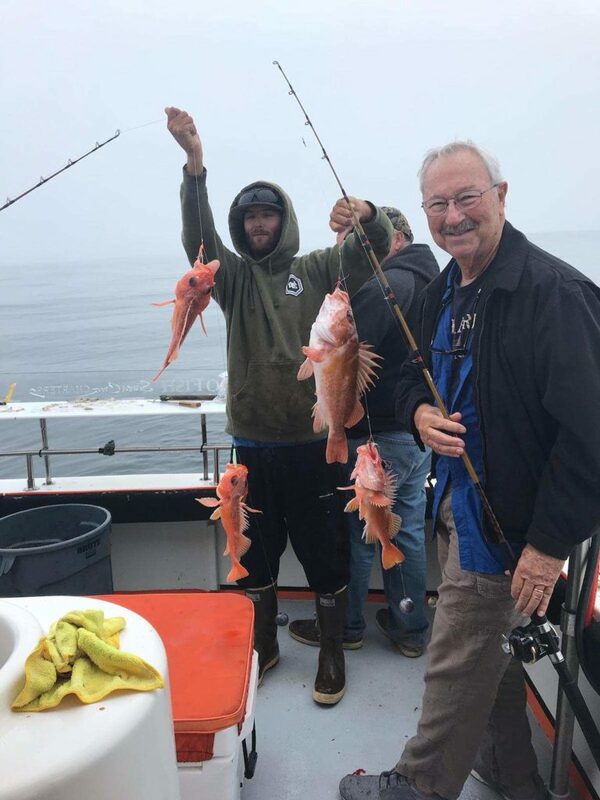 Captain JT then took the clients to the Davenport area where they caught almost limits of a variety of quality rock fish. 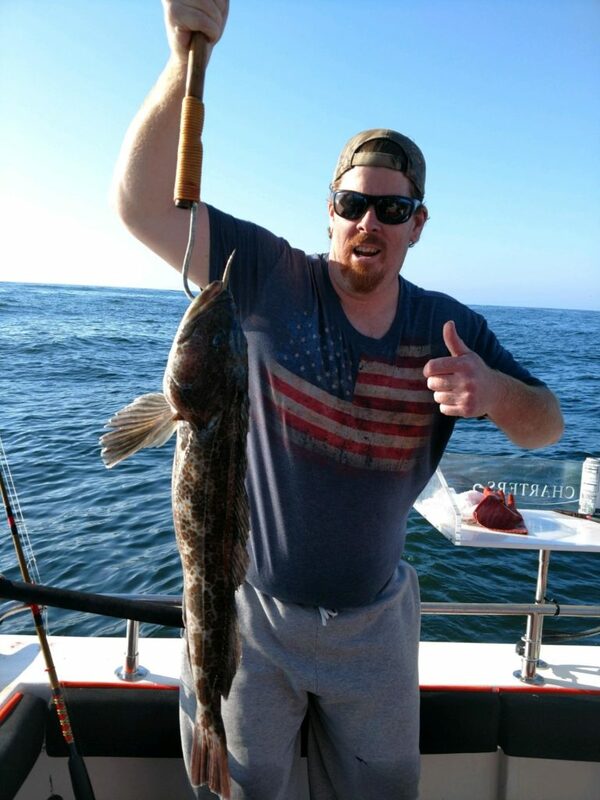 The afternoon charter found the ling cod landing 4 nice ones. Yikes. What a great day of fishing and crabbing. 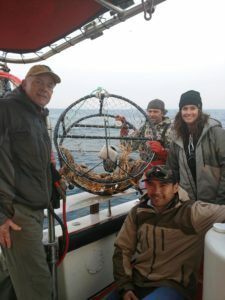 Captain JT and Deckhand JP took the clients to 10 of 30 crab pots set yesterday which yielded 47 Dungeness Crab. Yummy. 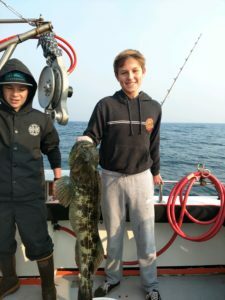 From there they head up the coast where the water was little bumpy but they caught limits of a variety of rock fish and 3 nice ling cod up to 12 pounds. 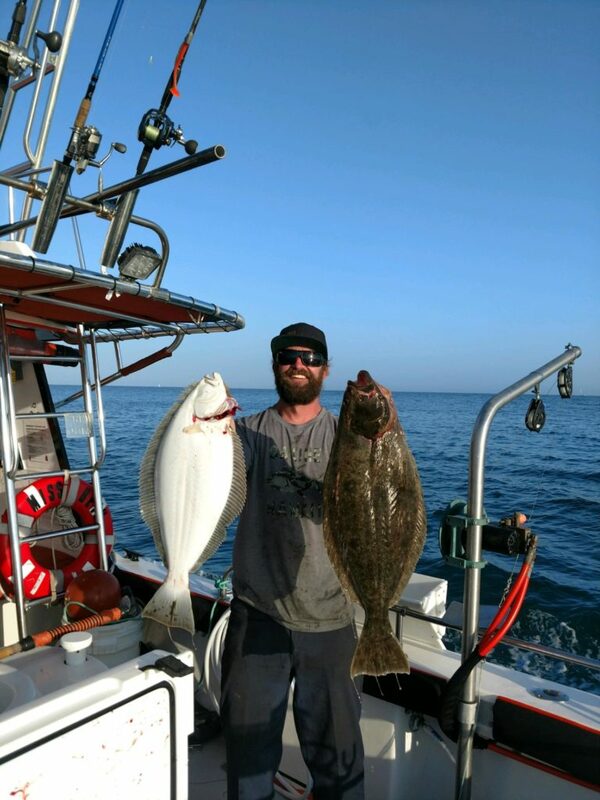 We have combo trips available. 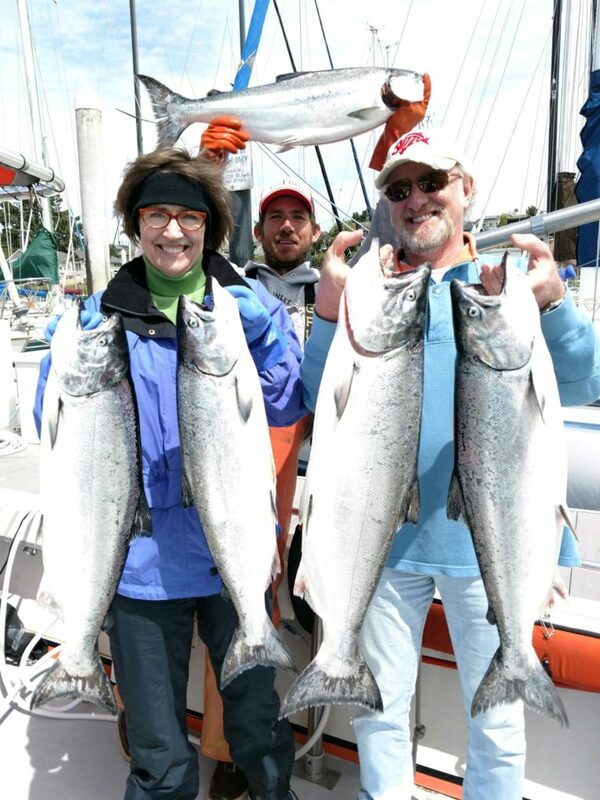 Call to book your charter. You will be a hit at the party. Today’s charter went catching again today. 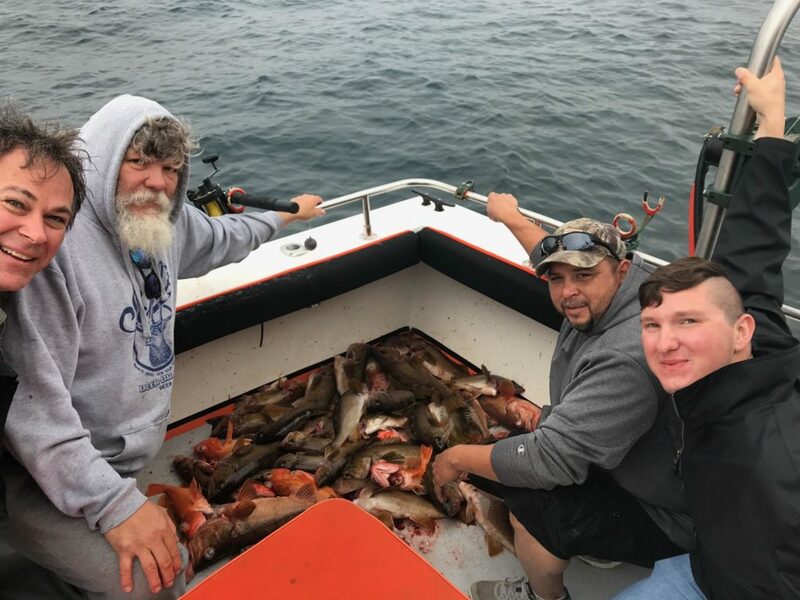 They fished the Davenport area where the rock cod bite was hot. 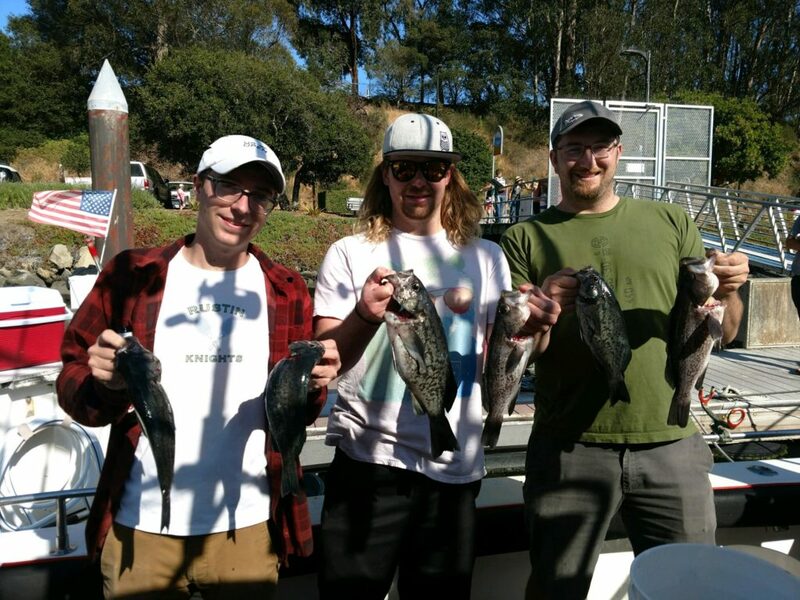 They caught early limits of a variety of rock fish. 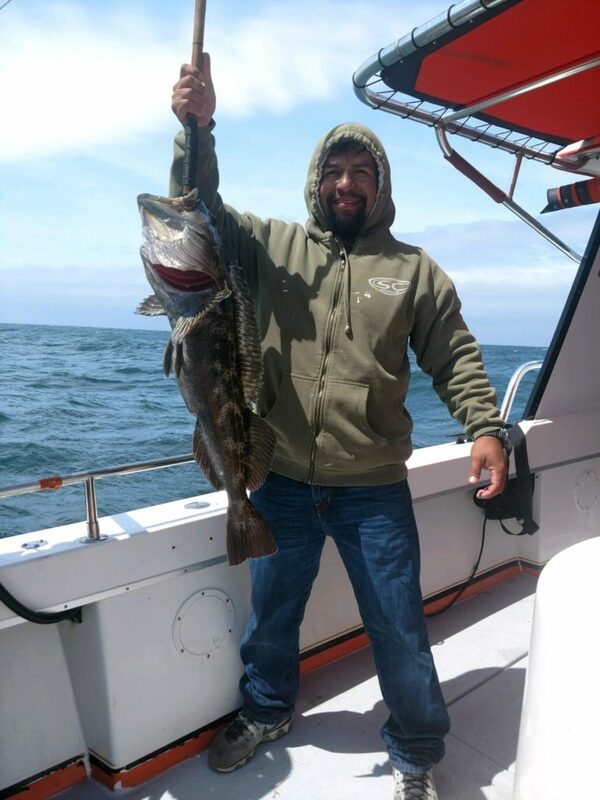 After catching limits Captain Ray and Deckhand JP decided to target Ling Cod. The first was too short but the turquoise color got everyone’s interest before tossing back to grow. 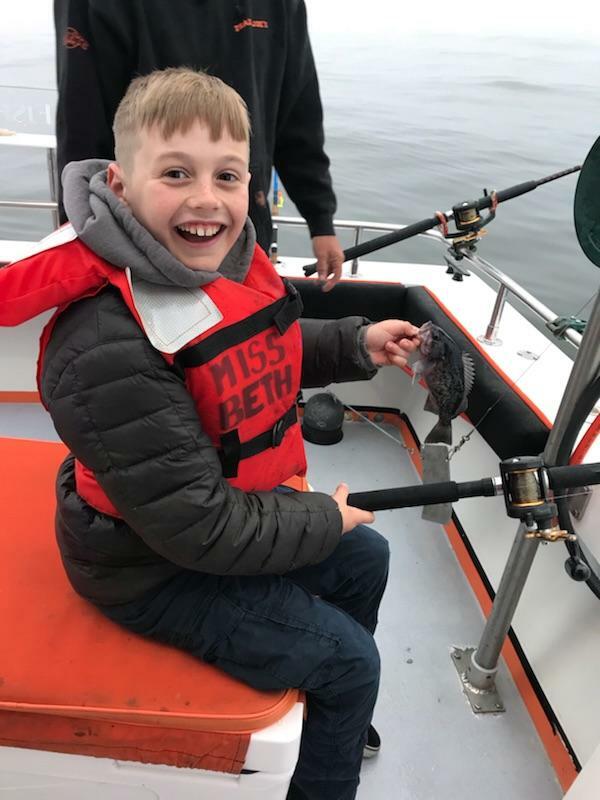 Next they caught a 14 pound keeper followed by a nice seabass. 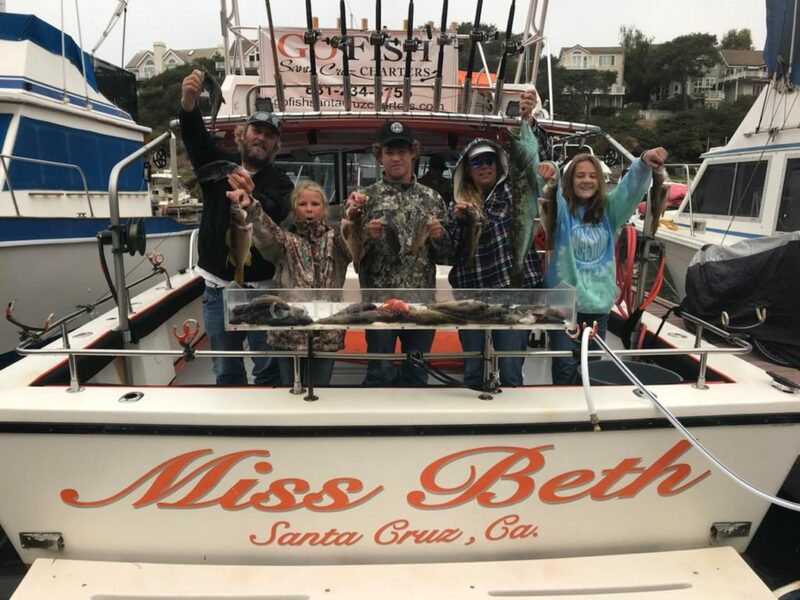 Mark Shipp caught the seabass it while his Dad and Sister watched the action. Call for booking your charter. You will have fun and several nice dinners. 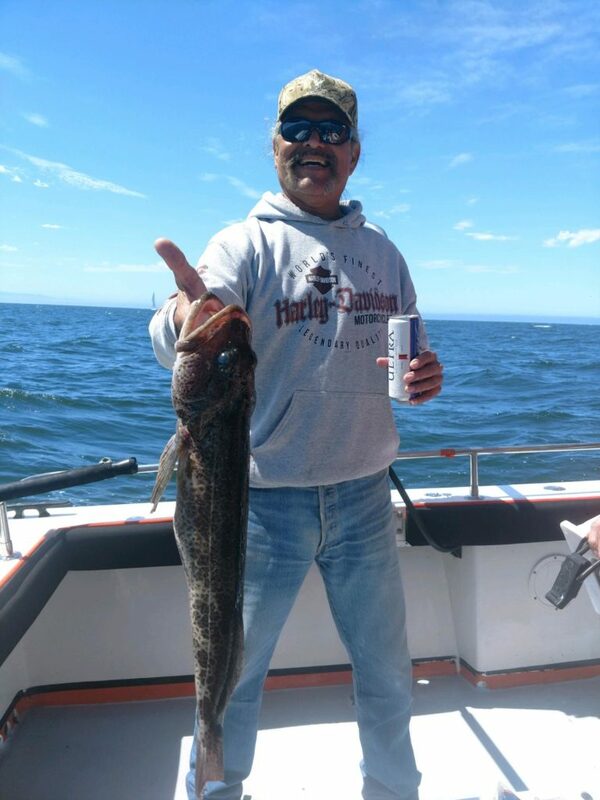 The fishing trip today was productive catching crew limits of rock fish and 5 nice ling cod up to 15 pounds. 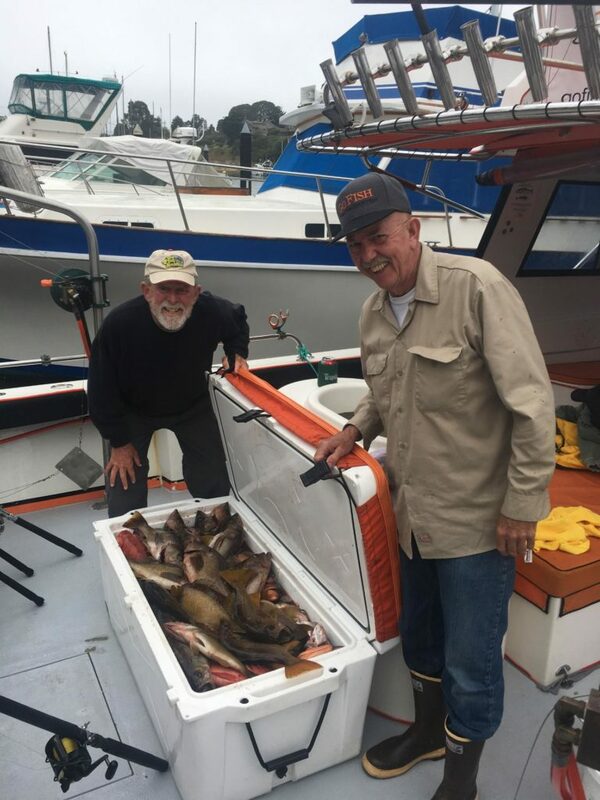 They fished near Davenport using herring and live bait. The water was flat calm with no wind. Call to book your charter. 831.234.6155. 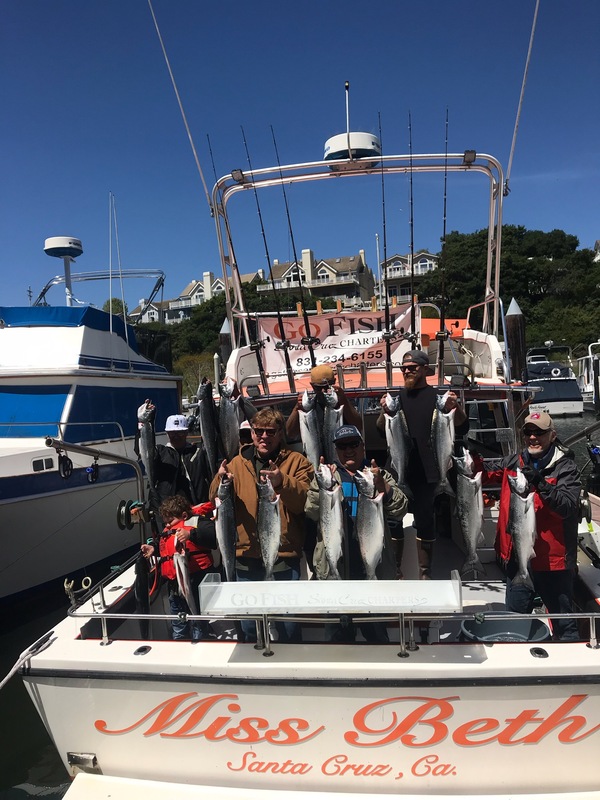 Captain JT took the clients to Franklin Point today where they caught limits of a variety quality rock fish and 10 big ling cod up to 16 pounds. They used whole squid live bait and shrimp files. The wind stayed down making the trip comfortable. The whales were out there which provided some entertainment. Thank you Mark and team for the charter. Thanks Don. 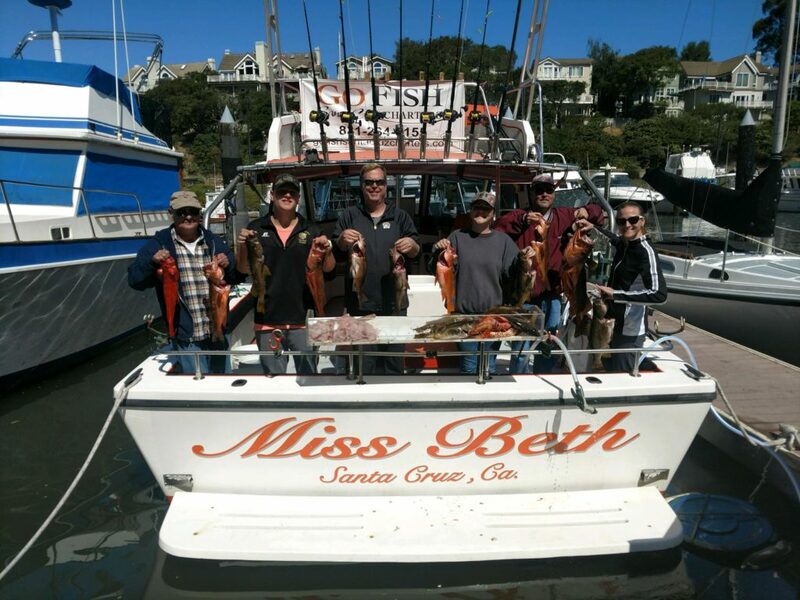 We have charters available. Call to book yours. Crab season opens next month. 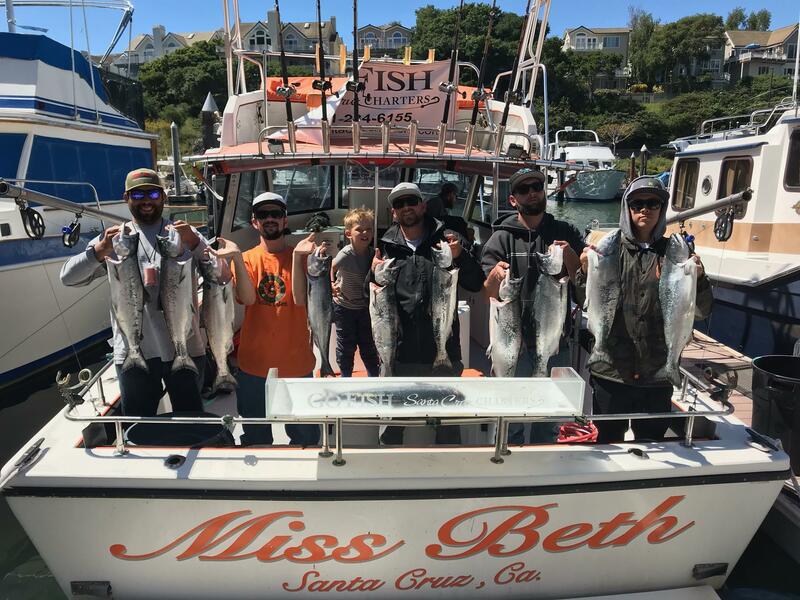 We will be offering combo trips. 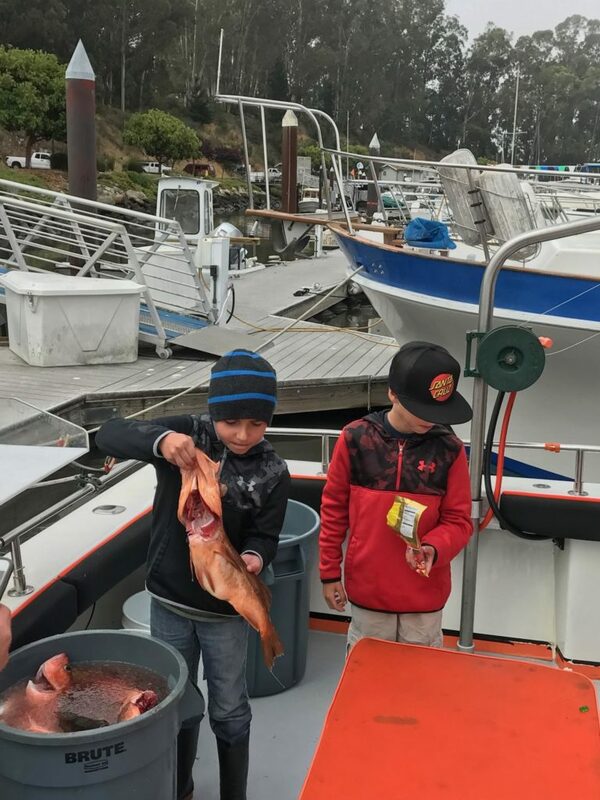 We fished Franklin Point and had a great day of catching. 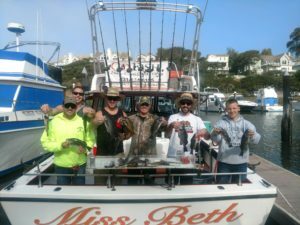 The clients caught a variety of rock fish. 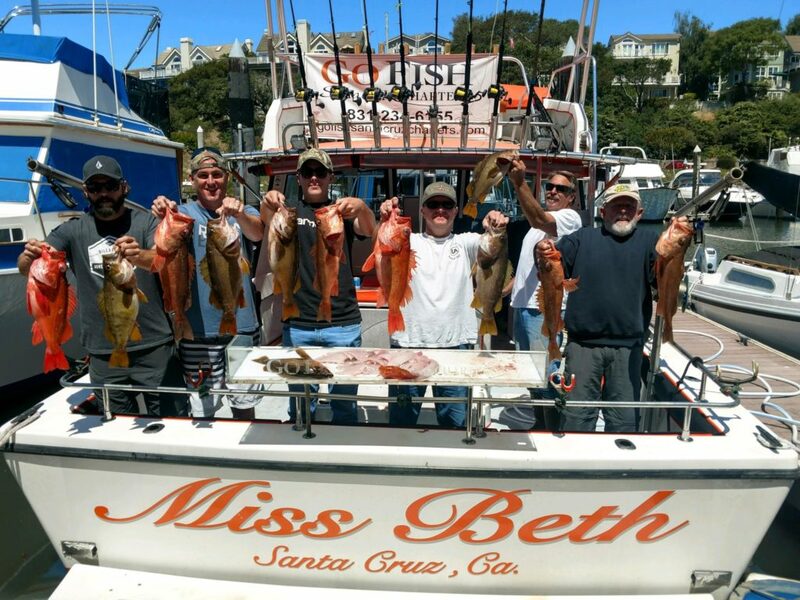 They fished in 40-80′ of water using several types of baits. Live bait and shrimp flies were productive for the schollie rock fish. 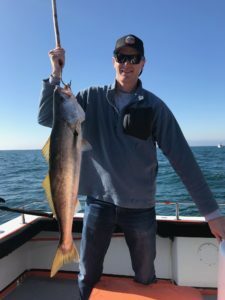 Whole squid on double treble hook was productive for the big vermillion and the ling cod. 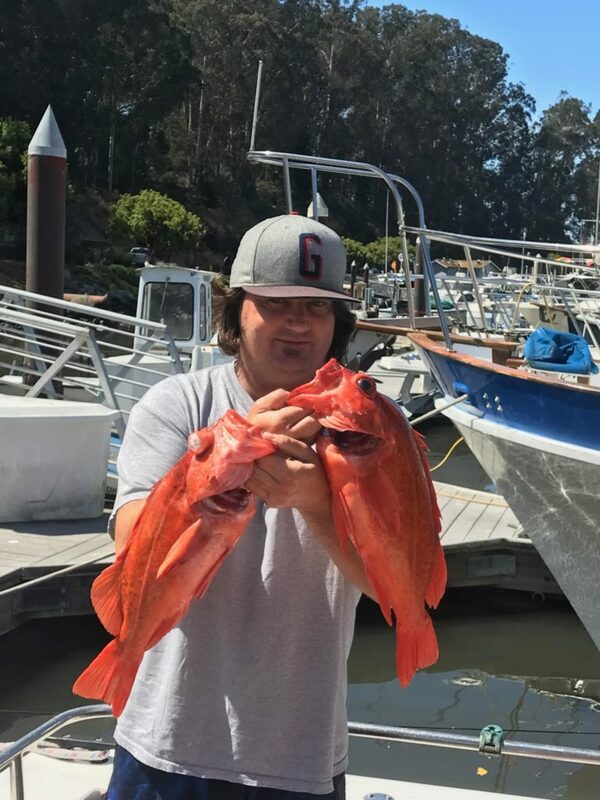 They landed 7 nice lings up to 15 pounds. Thanks Steve and team for the charter. Call to book yours now. 831.234.6155. 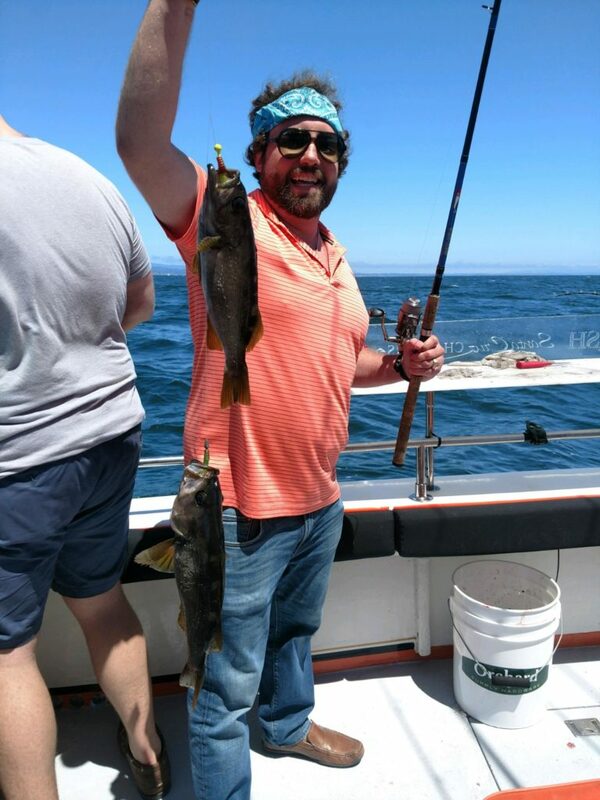 Today the two charters today caught alot of rock fish consisting of vermillion, blues, blacks, gophers and more. 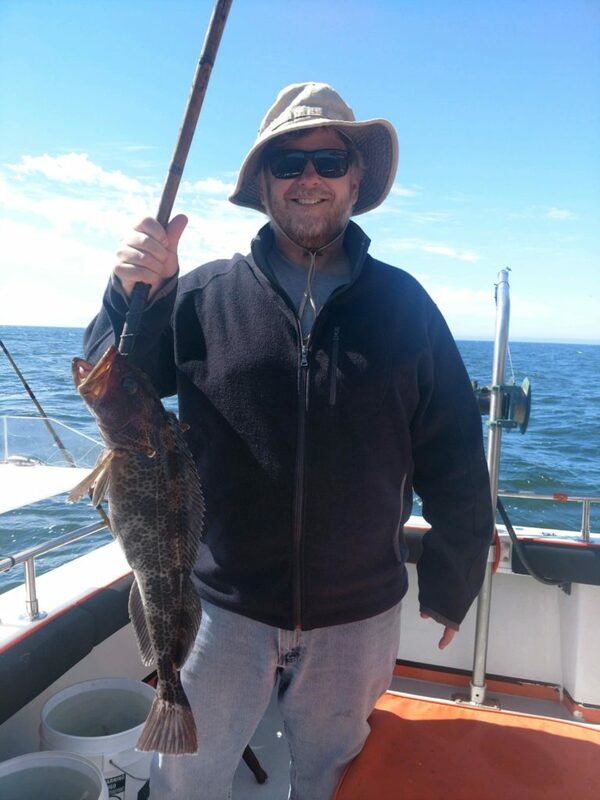 As a matter of fact limits of rock cod to the tune of 120 fish. 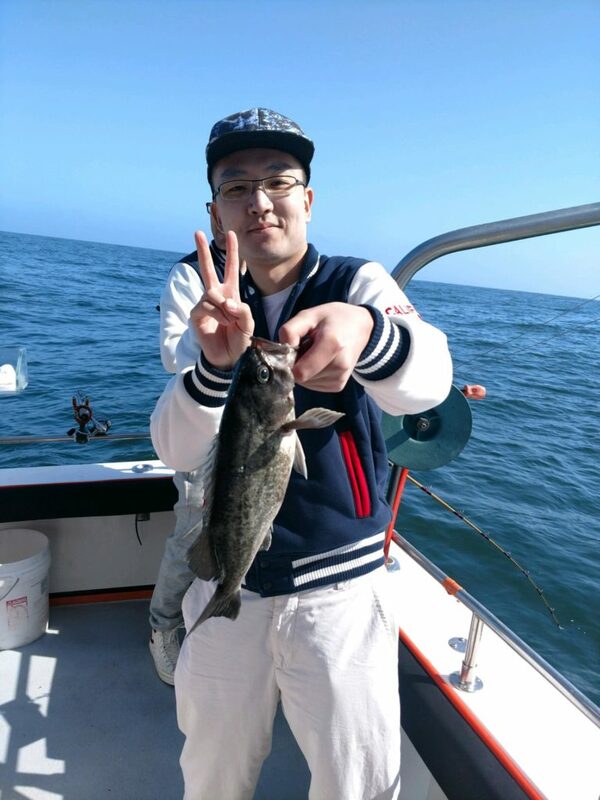 This morning charter landed 4 nice ling cod. 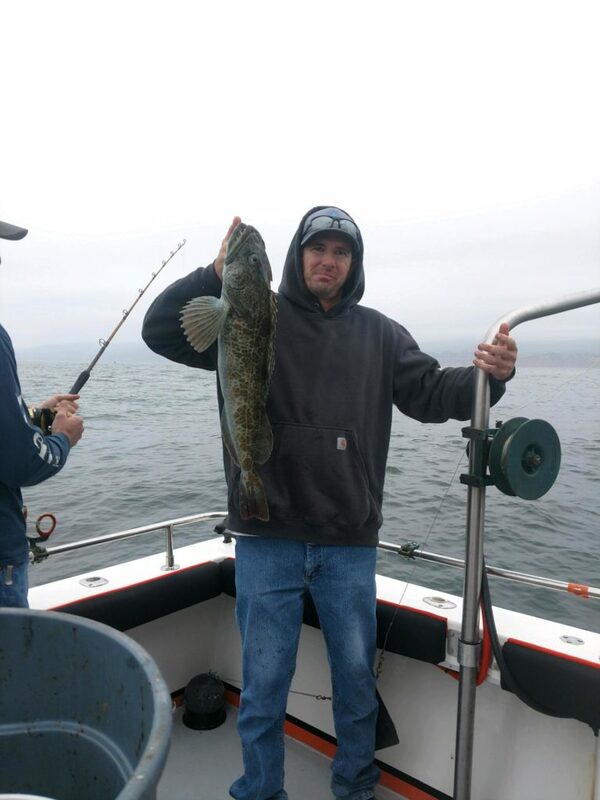 This afternoon the clients caught 2 nice ling cod. As always everyone had fun. You will too. Call to book your charter. 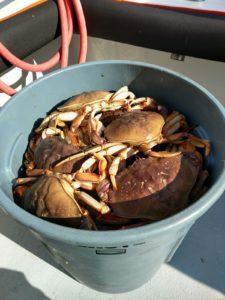 We are gearing up for crab season which will open in November. Get your reservations now. Your friends and family will love your crab for Thanksgiving and Christmas. Another great day of catching. Sean, his brother, and grandfather where here from Mountain View. 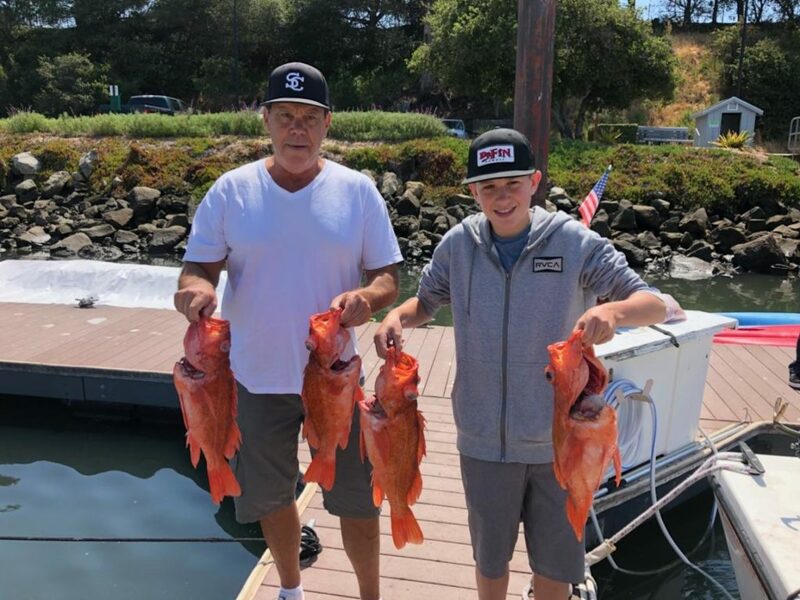 They caught limits of rock fish and a two nice halibut. 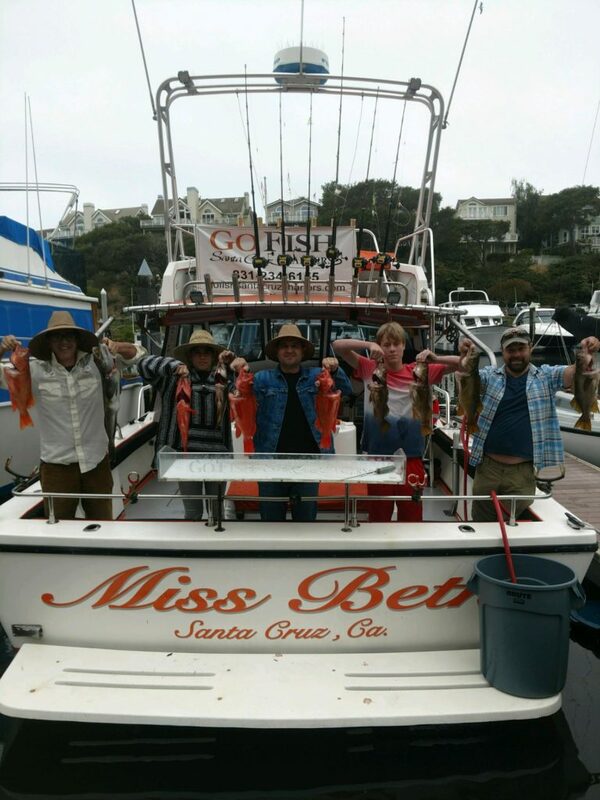 Thanks Sean and family for the Go Fish Charter. 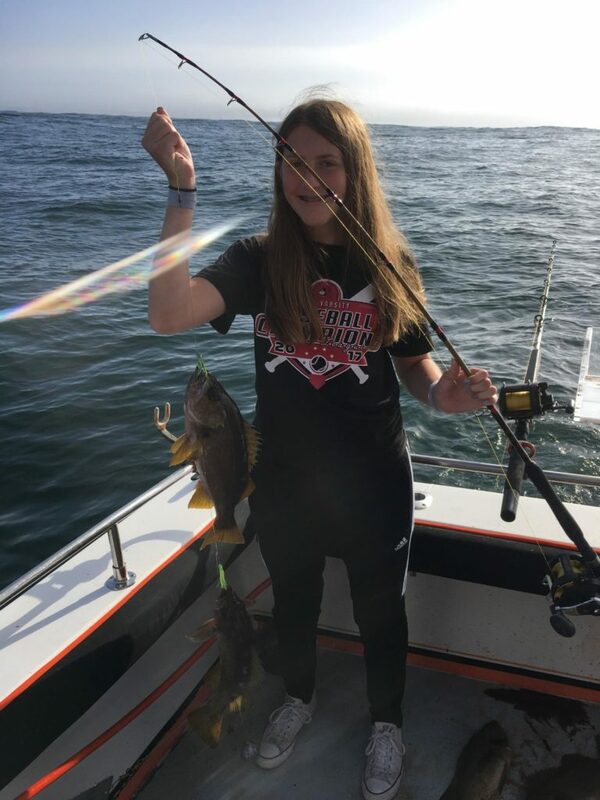 Everyone had fun today catching limits of a variety of rock fish. 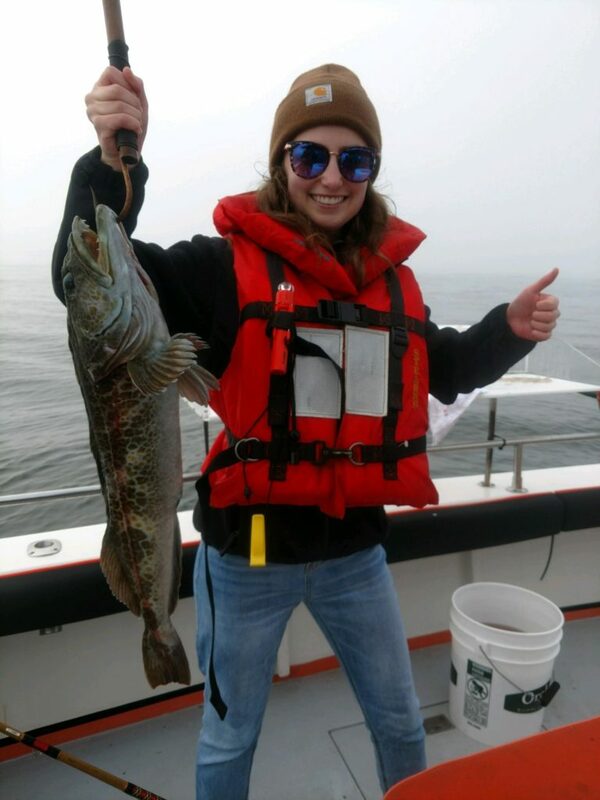 They landed a couple of nice ling cods up to 16 pounds. Thanks Virginia for the company event charter. Let us know when your team is back on this side of the world. 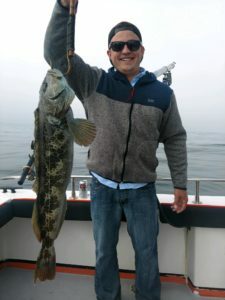 Check out Jason with his nice ling cod. 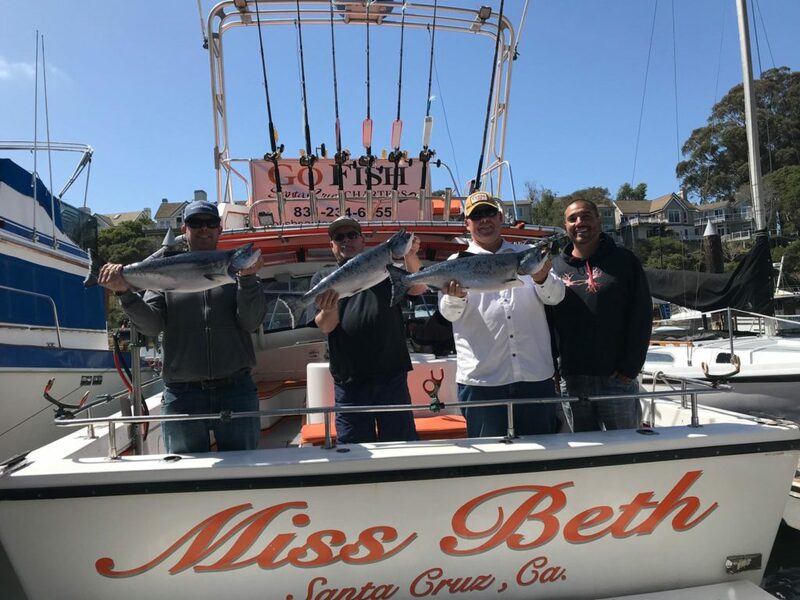 Go Fish Santa Cruz Charters. 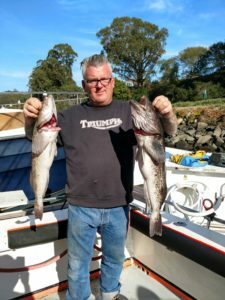 Today Chris and family fished locally and caught limits of a variety of quality rock fish. 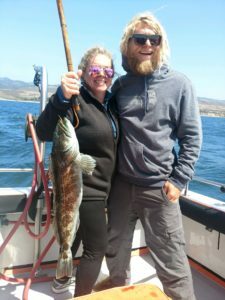 They caught a short ling cod that was put back to grow, landed a nice one and lost a big big one at the boat. Chris headed home to cook a great dinner that included vegetables and fruits he picked up at the fruit stand in Castroville. Talk about fresh and local. Thanks Chris for the charter. 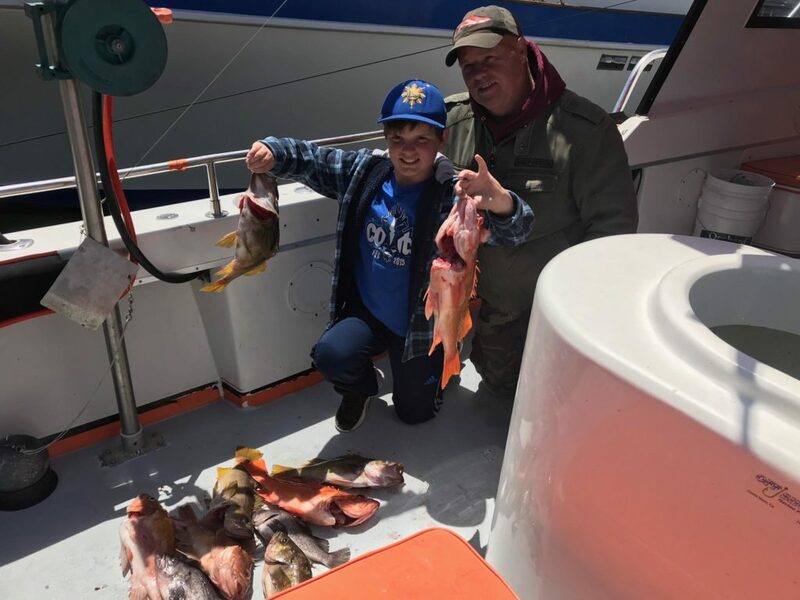 Captain JT and deckhand JP took a family catching today. 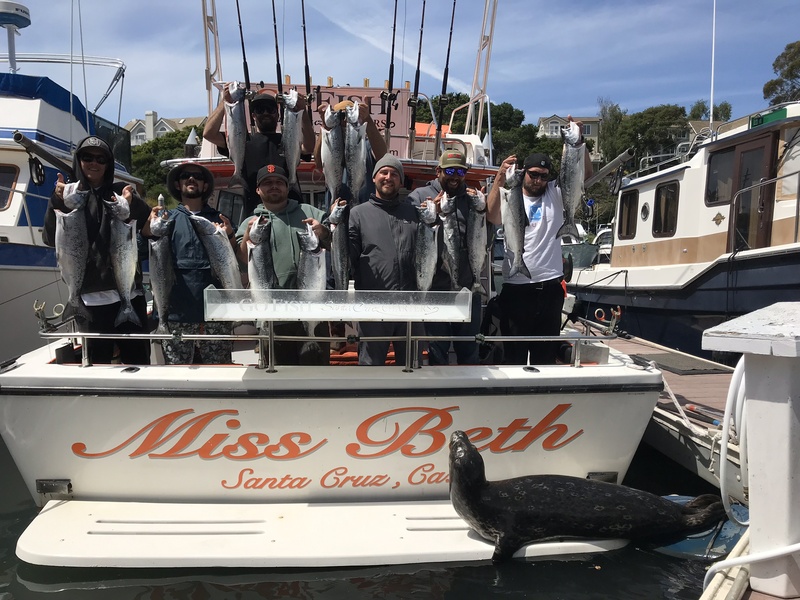 The charter boat headed north of Santa Cruz where they caught a varity of fish including, rock cod, ling cod and halibut. 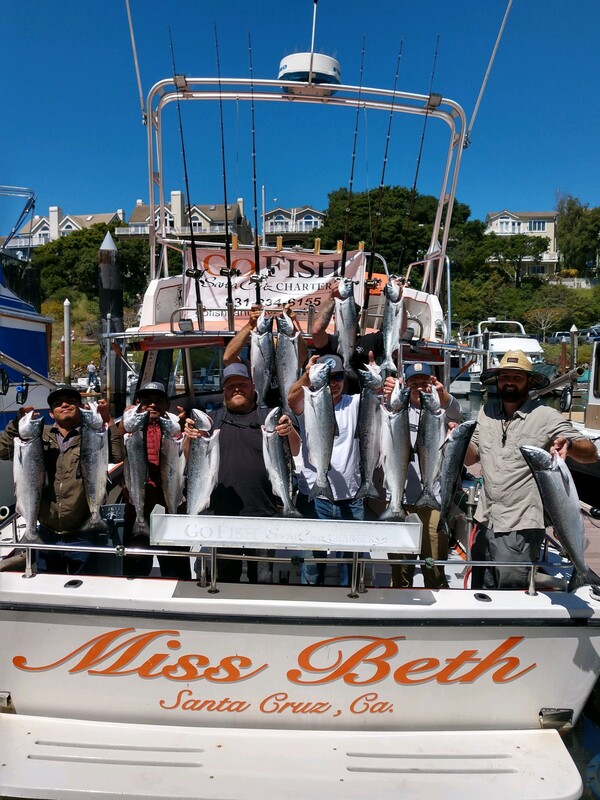 We have charters available. Call to book yours. Our clients today were here from New York. 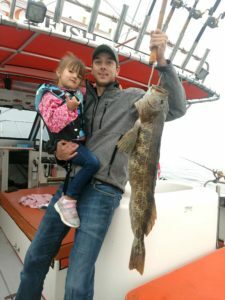 That sure enjoyed their fishing trip today catching limits of rock fish and one nice ling cod. The whales were out entertaining the vacationers adding to their great day. Amy reported it was a memorable day for the family. Thanks Dan and sons. Come visit us again. 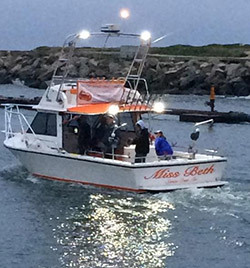 We have charters available. Check our availability calendar. 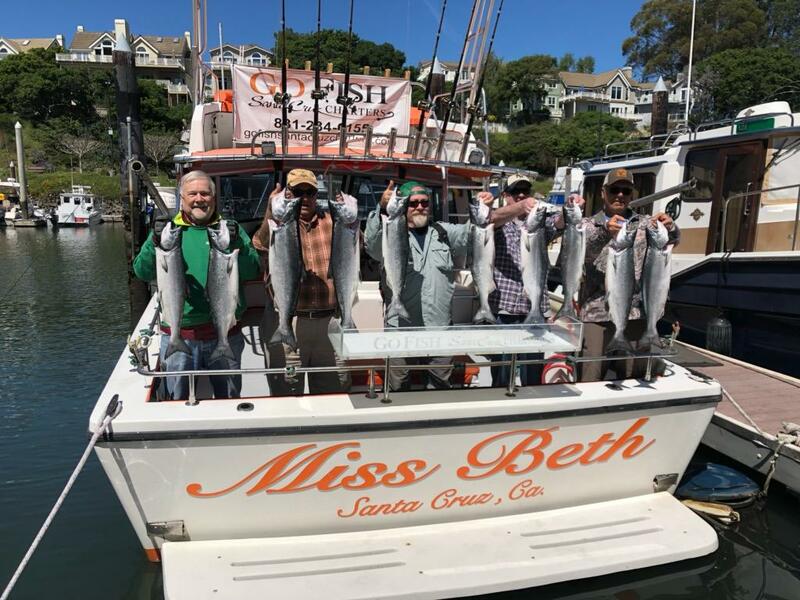 Come fish with us. Contact us at to book your charter. 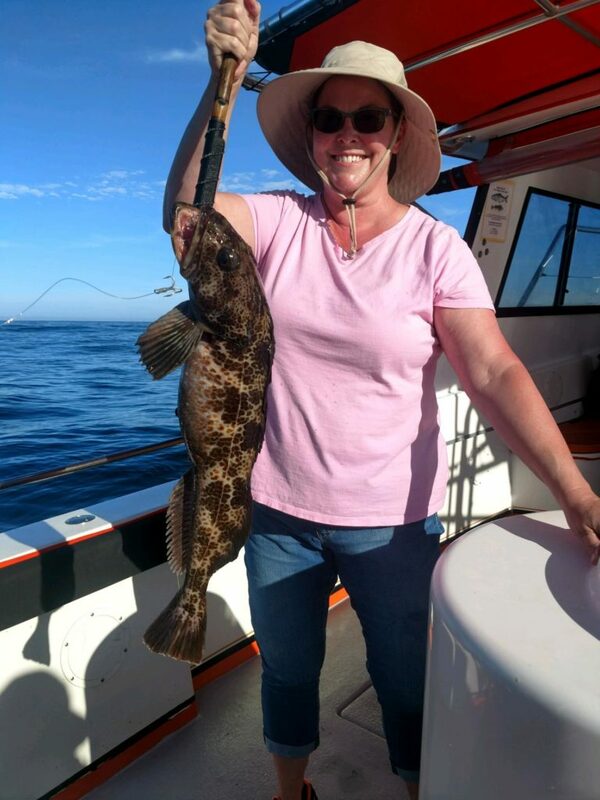 Today’s charter proves the rock cod fishing continues to be hot. Limits again for everyone. They caught blues, blacks and olives. The whales were out there and provided some entertainment. Call to book your charter. 831.234.6155. 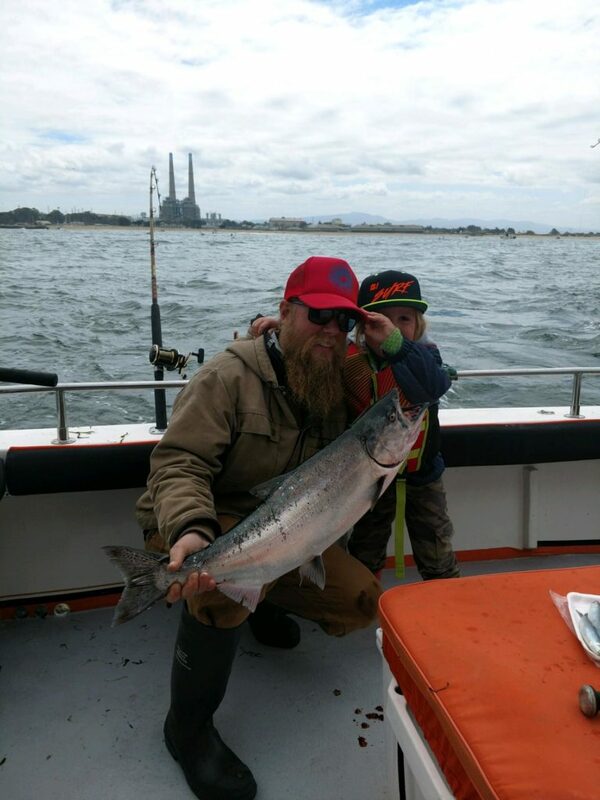 It was a Birthday Party charter for Caleb who came in from Modesto with five friends. And boy did they party. 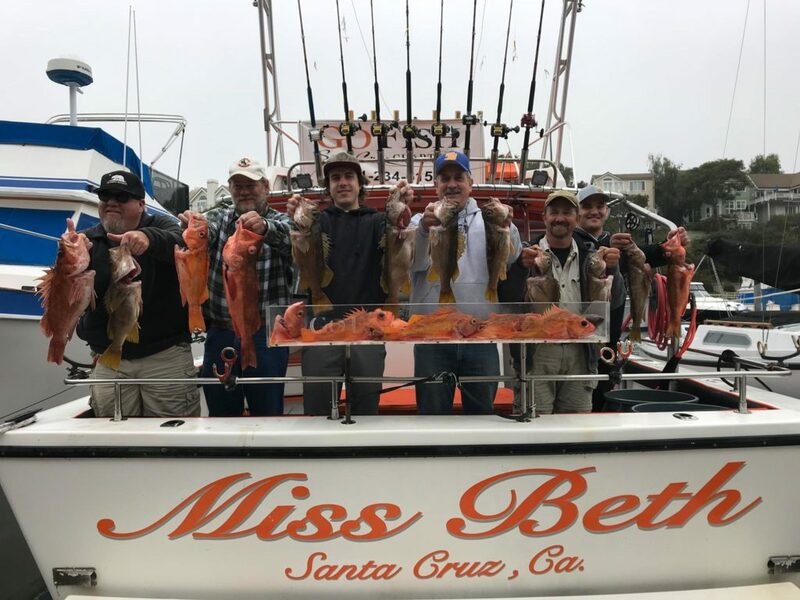 They caught limits of a variety of rock fish. Crew limits as a matter of fact. Happy Birthday Caleb. Call to book your party. 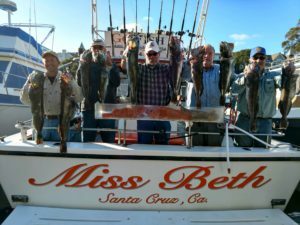 Your charter does not need to be for anything more than just a party to GO FISH. You will have a blast. 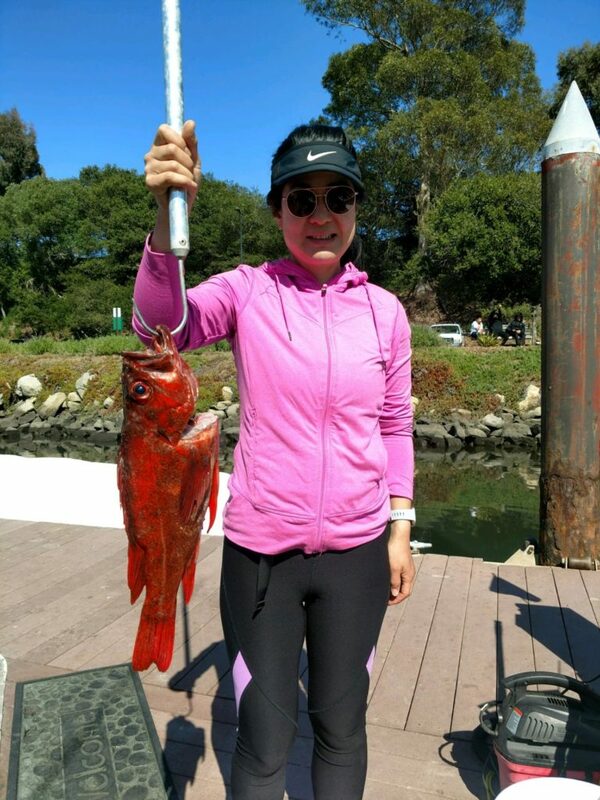 Come go fishing while the rock fish bite is hot. Limits again for everyone. 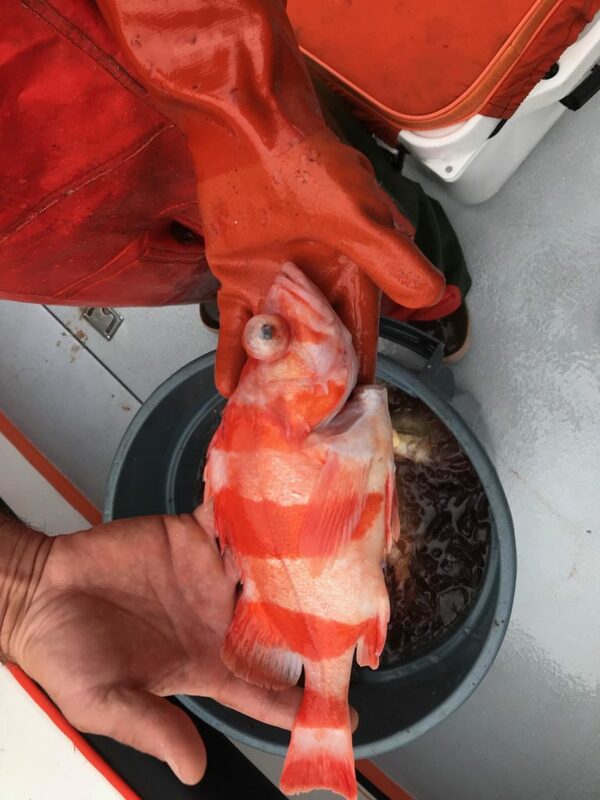 The vermillion was the primary catch. A lot of big ones = up to 8 pounds. Thanks Devon and team for the charter. Safe travels back to Canada.